Tizen, the open-source operating system Samsung hopes will trump Apple’s iOS or at least help it reduce its reliance on Google’s Android, may hit the markets as early as the first quarter of next year, sources said on Monday. “NTT Docomo has asked for a January release, but this is probably not going to happen so we expect the phones to come within the first quarter of next year,” one source told the local media on the sidelines of the first Tizen Developer Summit Korea. NTT Docomo, a leading Japanese network carrier that’s a part of the Tizen Association, is reportedly preparing marketing events for early next year. This means that the Tizen phones may be available for commercial use at the next Mobile World Congress that is scheduled to be held in Spain in February 2014. NTT Docomo reportedly was preparing to release them toward the end of this year, but had to defer on account of an OS upgrade from the Tizen 2.1.1 to the Tizen 3.0. Meanwhile, Choi Jong-deok, executive vice president of Samsung Electronics’ software center and software platform team, confirmed that true to the rumors, Samsung has indeed already been running the Tizen OS on the NX300M camera. “The rumors are true,” the executive vice president said, adding that he was certain of Tizen’s success. “Ask me if it’s going to be a hit, and I’m going to say yes,” the executive told The Korea Herald on the sidelines of the meeting. Choi also laid out how the upgraded Tizen 3.0 version would look when it hits the markets in the third quarter of next year. The major features include an updated Core OS and 64-bit processor supporting both Intel and ARM, while offering larger memory capacity and more advanced performance overall, Samsung said. The Tizen 3.0 also contains a 3-D UI framework that involves a 3-D rendering engine for 2-D and 3-D objects in 3-D surroundings. 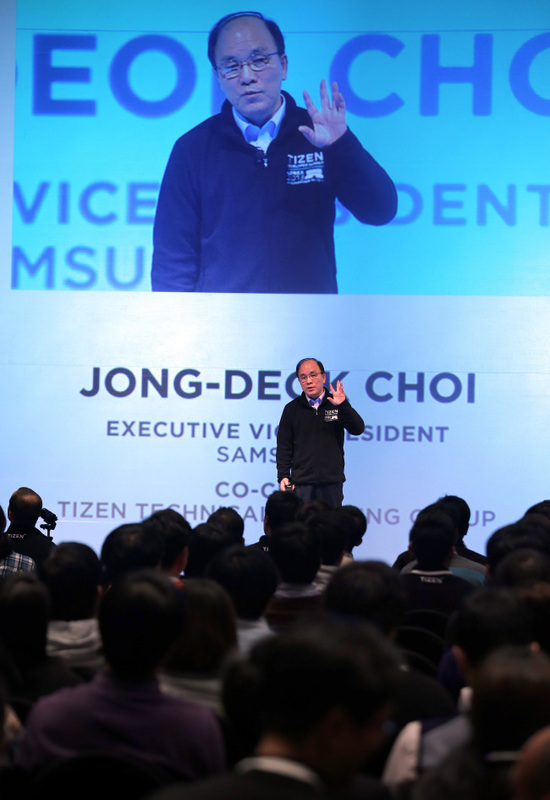 Earlier, Samsung executives said Tizen TV would not be released until after the phone. Kim Hyun-seok, head of Samsung’s visual display business confirmed last week that the TV would come only after the phone had been released. Tizen is the open OS platform being pursued by the nonprofit Linux Foundation. Samsung, Intel, NTT Docomo and Orange of France are among the technology steering group. A total of 10 others including Vodafone, KT Corp. and SK Telecom are serving as board members. Mark Skarpness, director of Systems Engineering at Intel, said that Tizen is a cross-platform that various devices including TVs, cameras, cars and other home appliances can access. Auto infotainment, for instance, is an area many carmakers including Toyota and Land Rover are interested in, the director said. Tizen reflects the desire of Samsung and its partners ― mainly chipmaker Intel ― to operate an open platform that is outside the Android boundaries. Google and Apple are both rivals in this sense, as they respectively operate Android and iOS platforms.